Ashford Double Drive Bobbin - Natural Finish. For Traveller and Traditional wheels. 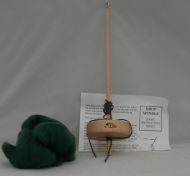 Ashford Jumbo Bobbin - Natural Finish.